Despite my obvious disdain for canned peaches, there is actually something I find much more unappetizing. Is there a more disgusting food? I can’t think of one at the moment … well, yes I can, however nothing that I would consider normal American fare. Rumor has it that my 90 year old grandfather truly loves a bowl of soggy corn flakes. This has nothing to do with his age. Apparently, he has just always liked his cereal soggy. Perhaps this is because he grew up during The Great Depression and ate his cornbread crumbled in his milk. I imagine cornbread and milk turns into mush rather quickly. I can only assume this to be the reason as to why he prefers his cereal soggy. Anyway … as much as I love and admire my grandfather, when it comes to our cereal preferences we are a world apart. In fact, I can think of very few first world breakfast problems that are more disturbing than a bowl of soggy, mushy cereal. Unfortunately, most of my favorite cereals have a tendency to go soggy very quickly. Take for example Frosted Flakes … one of the best tasting cereals out there and yet it does not stand up to milk for more than 3-4 minutes. If you pour a bowl of Frosted Flakes, you must be prepared to eat quickly! Let’s face it. Most cereals are not healthy. In fact, a pop tart might be equally as healthy as a bowl of sugar-laden cereal, though I’d definitely need to do some research before I claimed this to be a true and honest fact. While there are many cereals on the market that are supposed to be part of healthy breakfast, the truth is that this is something of a fallacy. There’s nothing wrong with a bowl of Cheerios or granola every now and again, but these are not the breakfasts of champions that we as an American society are led to believe. 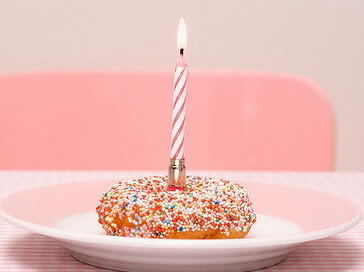 I think most of us can agree that refined foods are never our healthiest options. There are better options. Perhaps not quicker and easier options, but certainly healthier choices regarding breakfast foods. My family of seven goes through 1 1/2 boxes of cereal each time I serve it for breakfast. With each box costing an average of $4, that’s a lot of money for just one meal! I realize I have a larger-than-average family, but still … cereal is expensive! I don’t know about you, but my family is on a budget. We simply cannot afford to eat cereal all that often. In fact, cereal is so rare in my home that my children get as giddy over a bowl of cereal as they do over birthday donuts. But even with all the con factors (sogginess, healthiness, costliness), cereal still remained one of my favorite breakfasts. I grew up eating cereal. It was quick, generally tasted great (with the exception of Grape Nuts), and left me feeling satisfied all the way until lunch. 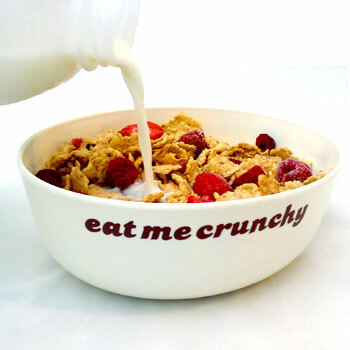 Oh, how I missed enjoying a lovely bowl of deliciousness at the start of each day! Which is why I was thrilled and delighted when I recently discovered a healthy way to make homemade breakfast cereal that never turns soggy! Actually, I cannot take credit for the idea or the recipe. 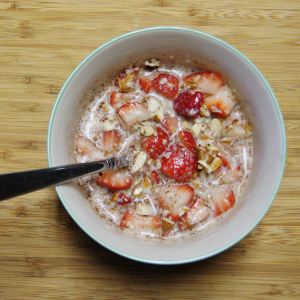 Stephanie Eusebi, a nutritionist and wellness expert in the Paleo world, shared this recipe for Nutty Strawberry Cereal on her website. Because it is a Paleo recipe, there are no grains to get soggy in the milk. I tried it out about a month ago, and I’ve been experimenting and playing around with creating my own breakfast cereals ever since. Y’all … I am on Breakfast Cloud Nine! Typically, I start off with choosing a few nuts: slivered almonds, chopped walnuts, raw sunflower seeds or pumpkin seeds. Just a small amount of each is great, or choose to have more of just one type of nut. The total amount of nuts should equal about 1/4 cup. Anyway, back to the hemp hearts. These little nuggets are a complete protein, easy to digest, and provide essential fatty acids omega 3 and omega 6, as well as a long list of vitamins and minerals. Hemp hearts are also very filling, and add a rich, nutty flavor. I put about one-to-two tablespoons in my bowl. Now that I have my cereal base, I begin to play around with flavors, depending on my mood and what other foods are available. Some suggestions are: unsweetened coconut flakes, craisins or raisins or other dried fruits, fresh berries of any sort (raspberry, blueberry, strawberry, etc), banana slices, fresh peaches. The list of options goes on and on. I just continue adding until I fill my bowl. Add a dash of cinnamon (if you like). Pour on the milk. I prefer almond milk, but whatever you like to drink will work great. Now relax and enjoy your bowl of tastiness! No rushing to eat it before it gets soggy. No worrying over the healthiness of your breakfast. And while I can’t exactly prove that the cost is cheaper than the boxed cereal option (because, quite honestly, I don’t feel like exerting the mental energy required to figure it out), I do believe it is at least a comparable cost. But the best thing … my mornings are so much happier now that I am beating the soggy cereal blues! Next Article A “Great Dates” Review … along with My Very First Give Away! Nothing worse than soggy cereal – yuck! Thanks for sharing! Cereal is definitely a comfort food but oh how it is getting more and more expensive. I definitely want to try this homemade cereal recipe!